I meet many people who understand enough French to get by in France, but then they freeze when they actually get there. They know they are likely to make mistakes, and that stops them from even trying to speak. French people won’t care much if you make mistakes, as long as you are polite. If you try to communicate and you do so with a polite tone, your effort will be welcome. But if you spend precious interactive time looking for the absolutely correct form in your head, and don’t utter a word until you’ve got it perfectly formed in your mind, French people will get impatient and move on. You need to be quick more than correct, specially when you go to Paris: it is a fast-moving city, like New York, and no-one has time for a hesitation. Pronunciation is really important. 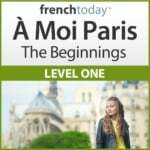 French is an evolving language, and book French is extremely different than spoken French. So make sure you train with audio tools, always, even when you are studying grammar or verb conjugations. Speak up! when they get shy, many people tend to speak very softly. But if you are looking for your words AND the person can’t hear you, it might be a bit too much! So don’t yell, but be careful not too whisper either. If the French correct your French, don’t take it personally… It’s a French habit! French is hard, and kids need to be corrected all the time so they can learn all the pronouns and the conjugations… So we correct them. Hence, correcting someone who makes a mistake is a natural thing for us. We can’t imagine for a second that it’s rude, or that it may intimidate the person. That’s why I wouldn’t encourage your French friends to correct your French… it will make your life a living hell! So, get to the essential elements of what you are trying to communicate. Use very simple words and simple constructions, stay in the present tense if tenses are a problem, smile, and never forget to be polite.